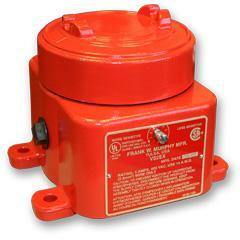 The VS2EX Series switches are shock sensitive mechanisms for shutdown of engine or electric motor powered equipment. These switches use a magnetic latch to ensure reliable operation. The VS2EX has a base mounted case, explosion-proof aluminum alloy housing; meets NEMA 7/IP50 specifications; Class I, Division I, Groups C & D; UL and CSA listed with 480 VAC rating. In place of the leaf-type contacts, 2-SPDT snap-switches are used in this model. Sensitivity is externally adjustable and, when tripped, the VS2EX gives a Tattletale indication on the reset button. 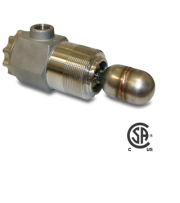 Ideal for use on engines, pumps, compressors, heat exchangers and pumping units – the VS2EX can be used anywhere shutdown protection from damaging shock/vibration is desired. Switches are field adjustable to sensitivity required in each application.